I took a kick at the can from about 11am to 3:15 today. the weather warmed to 35 from 32 this morning and the water was a nice green color today. As I walked into the gorge I had a smile on my face. There was nothing but fresh snow in front me. We all like to hit first water for it fires up are anticipation. I walked to the bottom of the path and found a 4 ft branch that i used as a walking stick. It help me navigate my way across the stream around the shelf ice and boulders. Once I set up thigh deep in front of the shelf ice, I attempted to work some magic to no avail. Most of the time was spent negotiating the slush and broken shelf ice that was floating down the creek here and there.I was at a spot where I have caught a number of fish through out the season but they were either not cooperating or not there. 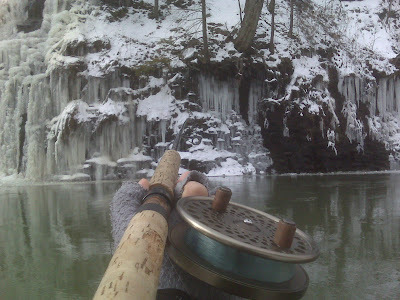 After thoroughly working the hole I worked my way upstream to a faster area which holds a few fish in the winter as it has sufficient depth and does not freeze int he winter. The answer was Nada,zero, and Zilch. I looked upstream as about 3 hundred yards up around the bend is a nice spot i like to fish that always holds. I did not work my way up to it as there was some tricky shelf ice and uneven stream bed to work my way through. Being alone, I didn't want to risk the odd slip and accidental injury. I though to myself there will be other days to get there and give it shot. On the way back to my access point I ran into 3 guys going in to fish and told them about the lack of success. I don't think they believed me. I hope they turned on for them. Into the truck I went to once of the more popular areas on the creek and the parking lot was full with 5 cars. The main pool was occupied with 4 or 5 guys. I attempted to walk upstream but half way up I could see someone in the B spot. I was relegated to fish secondary water with no luck but the sun started to pop out and 35 degrees felt like 65 degrees after the cold day before. The clock struck 2 and I burnt the last hours of daylight on a smaller trib hoping I could run into small pod in solitude. That would not be the case. I park my vehicle to find a few guys in my a spot with 2 fish on a stringer. I walked by them they had a look on their face. Maybe it was my Lucky Toronto Maple Leafs hat I busted out to try to change my luck. They probably thought to themselves F'ing Canadians being that they may have been locals. I used to get that all the time walking down the stream with Leafs gear and a centerpin years ago.Not so much these days. So I bushwhacked it upstream to some decent water. Once again no fish for me but I had had the benefit of a few hours of solitude and that was good enough for me today.